Your vehicle can tow a trailer if you carefully observe the load limits, use the proper equipment, and follow the towing guidelines. Check the load limits before driving. 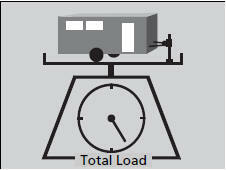 Maximum allowable weight of the trailer, cargo, and everything in or on it must not exceed 1,000 lbs (450 kg). Towing loads in excess of this can seriously affect vehicle handling and performance and can damage the engine and drivetrain. The weight of the tongue with a fully loaded trailer on the hitch should be approximately 10% of the total trailer weight. • Excessive tongue load reduces front tire traction and steering control. 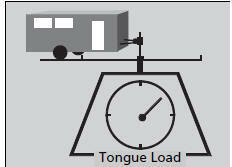 Too little tongue load can make the trailer unstable and cause it to sway. • To achieve a proper tongue load, start by loading 60% of the load toward the front of the trailer and 40% toward the rear. Readjust the load as needed. Check if all loads are within limits at a public scale. If a public scale is not available, add the estimated weight of your cargo load to the weight of your trailer (as quoted by the manufacturer), and the tongue load. Never exceed the gross weight ratings.